Here’s where it all starts! This little baby is a one person, foldable raft. Suitable for canals and rivers. 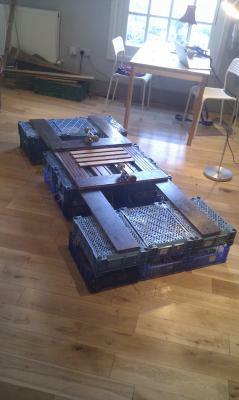 She’s made of bottles, plastic crates, skate wheels and a few old floorboards. 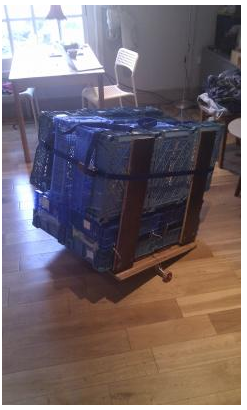 It all folds up to a nice neat cube thats a reasonable trailer size and not too heavy. It clips onto the back of a bike pannier for bike trips and is modular so two rafters can join up together, nice!